If you're like me, the last couple of weeks of school present the greatest challenge of all. Your curriculum has been taught, your students are ready for summer, and let's face it, you're ready for summer too! However, any teacher with experience knows how important it is to keep students engaged in their learning right through the end of the year! Fifth grade teachers REALLY know this, because our students are ready to be free of elementary school and begin their middle school adventures. So, I've got a tried and true activity that will engage your students in their learning from start to finish. When we have just over a week left, I assign an in-class math project. The objective? 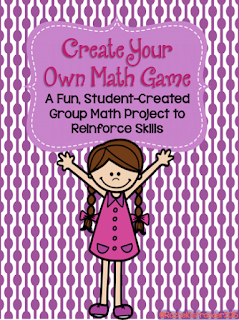 For students to work in groups of 3-5 to create their own math games. My students are always excited about this assignment and they are even more excited when I tell them that their creative efforts will be rewarded with a game day during the last week of school! Now, I do set some rules for the games that they create. First, they know that they must create games that are appropriate for their grade level. That means that my fifth graders are not creating addition or subtraction flash cards. Before I set them to task we discuss different games that they've played throughout the year that they could use as inspiration for their own game, and I make it clear that their games can be inspired by another game, but certainly not a carbon copy of one. Before we begin, we brainstorm the many different skills and strategies that they've learned throughout the year that they could include in their game, and they are certainly encouraged to create a game that requires the use of multiple skills and strategies. After our brainstorm, I assign their groups (or let them choose, if I think this will lead to success), and the planning begins. The first day is all planning, from brainstorming ideas, to agreeing on an idea, to writing down the materials that they need (and I do stipulate that all materials should be found in the classroom) and the directions that must be followed. Often, they will begin with one plan and then realize that it's not working as planned, and so they are revising their ideas as they create. It's an awesome opportunity for teamwork. 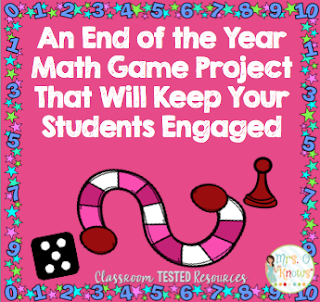 It normally takes my students between 3-5 days to complete this project, most of which are creative days where they are working together to plan and create their game, and the last of which is there is game day, where they rotate through each game. Before they leave each game, they leave a positive note of feedback for the game creators. It's a really fun and engaging way to wrap math up for the year. You can grab everything you need for this activity by clicking on the image below. Hang in there! Summer is almost here!